Ankylosing spondylitis is an inflammatory arthritis that affects up to 1 in 200 people. It primarily affects the spine, but can also involve the hips, knees, shoulders, and rib cage. Long-term back pain and spinal stiffness often occur with AS. AS is often misdiagnosed as ordinary "low back pain". Ankylosing spondylitis is now considered to be one of two types of axial spondyloarthritis (axSpA). The other is non-radiographic axial spondylitis (nr-axSpA). The latter disease is considered to be an earlier form of AS (even though it may not become AS later) before structural changes to the sacroiliac joints show up on an X-ray. Otherwise, the signs and symptoms of the two diseases are similar. Clinically, the distinction is recognized; however, provincial medication formularies have not yet caught up with the new definition. Rheumatoid arthritis is an autoimmune disease where the body's immune system mistakenly attacks its own healthy joints. The disease process causes swelling and pain in and around joints and can affect the body's organs including the eyes, lungs, and heart. Other joints that are commonly affected by RA are the hands and feet, elbows, shoulders, neck, jaw, ankles, knees, and hips. Approximately 300,000, or 1 in 100 Canadians live with RA. Psoriatic arthritis is a form of inflammatory arthritis which causes swelling and pain in and around joints, as well as a scaly rash on the skin. The joints most commonly affected are the fingers, wrists, toes, knees, shoulders, elbows, and ankles. PsA also affects the tendons and ligaments around the joints. It all started last summer in Vancouver with research stakeholder roundtable discussions on how inflammatory diseases including rheumatoid arthritis, ankylosing spondylitis, and psoriatic arthritis can lead to complications such as heart attacks, strokes, lung clots, infections leading to hospitalization, osteoporotic hip fractures, specific malignancies, diabetes mellitus, and chronic obstructive pulmonary disease. Roundtable participants spoke about how it is becoming increasingly clear that individuals with chronic inflammatory conditions display significantly shorter life expectancy and suffer from severe complications, chief among them heart attacks, strokes, lung clots. At the roundtables, researchers and informed patients theorized that improving treatment of inflammatory disease could lead to reduced patient morbidity and mortality, and healthcare costs. These discussions gave birth to the formation of a multi-disciplinary team and research project called "PRECISION: Preventing Complications from Inflammatory Skin, Joint, and Bowel Conditions." What sets PRECISION apart is that most previous research has treated arthritis complications as though they were comorbidities (the presence of one or more diseases, or disorders, in addition to a primary disease), rather than the direct result of chronic inflammation. 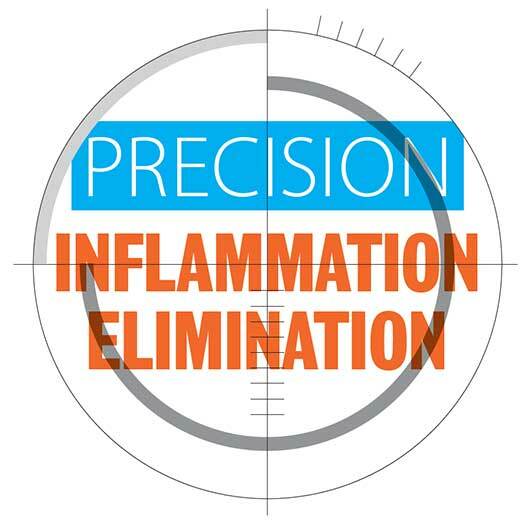 Instead, the PRECISION study treats complications in a new way–that is, by seeing them as caused by inflammation. If correct, then complications are potentially avoidable, and researchers can begin to design programs to reduce or eliminate their occurrence. Evaluate and prevent inflammatory complications. Assess the exact role of inflammation in causing various complications. Test pilot health interventions to reduce or prevent complications using pharmacists, primary care physicians (PCPs) and case managers (a person who helps to identify available resources within the healthcare system, with the goal of enabling clients to lead a healthy life in the context of their chronic disease). Develop tools to improve patient self-management by monitoring physical activity through wearable digital technology, like fitness wristbands or bracelets. How common and how costly complications from inflammatory disease may be. What predicts which patients will develop a complication from	these diseases. The effectiveness of new ways to diagnose and treat inflammatory diseases. Why Aboriginal communities have a higher chance of developing arthritis and why the severity of disease is more severe. Why women have a greater risk of developing chronic inflammatory conditions/diseases. Which types of physical activity help people with inflammatory diseases. Arthritis Consumer Experts (ACE) is a proud collaborator of the PRECISION study. One of our first activities was to conduct a PRECISION survey to obtain an arthritis consumer viewpoint on arthritis, inflammatory bowel disease, and skin diseases. 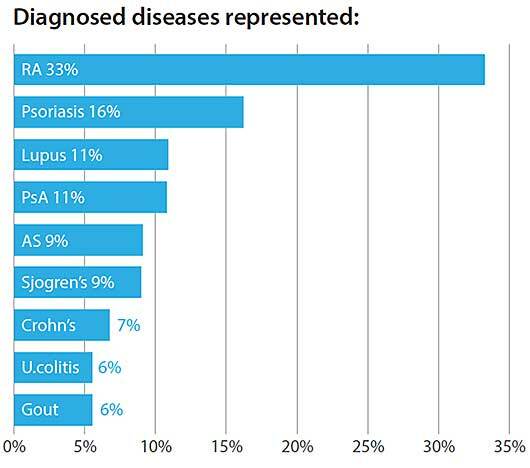 People living with rheumatoid arthritis, psoriatic arthritis, ankylosing spondylitis, lupus and lupus-like diseases, gout, osteoarthritis, inflammatory bowel disease (Crohn’s and ulcerative colitis), or skin diseases (psoriasis) responded to the PECISION survey. In a span of three three weeks, there were a total of 636 respondents. 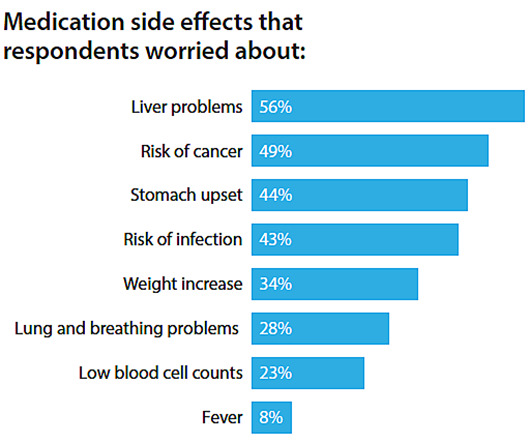 When it comes to managing their disease, most respondents took more than one medication and worried about side effects. Eighty-four percent of the respondents preferred to manage their disease with a healthy lifestyle. In comparison, only 16 percent preferred to manage their disease with medications. 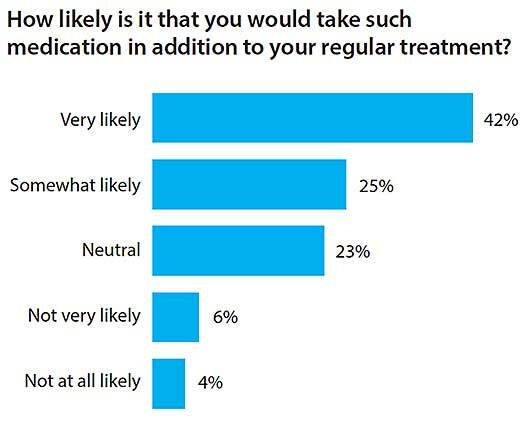 It is important to remember that the survey respondents' responses were related to their concerns about potential side effects from a medication, not ones they were currently experiencing themselves. Also, we remind our readers that depending on the severity of a person's disease and their doctor's diagnosis, maintaining a healthy lifestyle may not be sufficient on its own and medication may be required to treat and manage their disease. 97.5 % of respondents believed it was important to invest in research on medications for decreasing heart attacks, leg clots or premature death, all of which are consequences of chronic inflammatory diseases. Although medication adherence is a key factor in chronic disease management, nearly 58% of respondents were not interested in ways to help them remember taking medications as prescribed or on time. Adherence levels can fall quickly after starting therapy. Adherence to long-term therapy for chronic illnesses in developed countries averages only 50%. Non-adherence wastes resources, represents a missed opportunity for therapeutic benefit, and is associated with poorer patient outcomes. Non-adherence is a leading cause of preventable morbidity, mortality, and cost. At the University of British Columbia (UBC), Mary De Vera, Assistant Professor and recipient of the Professorship in Medication Adherence with the UBC Faculty of Pharmaceutical Sciences, said that the objective of the Professorship is to conduct research and share knowledge and best practices on medication adherence and its connection to improved health outcomes and healthcare sustainability. The Professorship includes such innovative techniques as developing the first ever "living laboratory" whereby practicing pharmacists will learn new skills in working with patients on adherence issues. $7 - 9 billion: the estimated annual cost of non-adherence in Canada in 1995. $300 billion: more recent cost estimates from the United States. 69%: the proportion of medication-related hospitalizations due to non-adherence. 125,000: the number of unnecessary deaths per year due to non-adherence. From the findings of her PhD research, Dr. De Vera adds to these statistics: patients with rheumatoid arthritis who stopped taking statins raised their risk of a heart attack by 67% and death by 80%. According to Dr. De Vera, "Medication non-adherence is truly an epidemic and as a pharmacoepidemiologist, my research program is focused on moving toward multi-disciplinary approaches to understanding and solving this health problem. It will take engaging patients, physicians, pharmacists, other healthcare professionals, and policy makers to build multi-disciplinary teams and provide unique perspectives to the problem. It will take involving not just patients but their support network. It will take borrowing tools from other disciplines and bringing them together. It will take the willingness to create new knowledge." For pharmacists to educate and follow up with patients to increase medication compliance. For primary care physicians to increase screening of complications using digital technology such as e-reminders. For case managers in Aboriginal communities to facilitate integrated care of people with chronic inflammatory conditions. The lead researchers on the PRECISION study represent an outstanding multi-disciplinary team of well-qualified experts from across Canada. Dr. Esdaile is an internationally respected rheumatologist who spearheaded the creation of the Arthritis Research Centre of Canada. His areas of research include rheumatoid arthritis, osteoarthritis and systemic lupus erythematosus. Dr. Esdaile has written more than 200 publications in refereed journals. Dr. Abrahamowicz is a James McGill Professor of Biostatistics at the Department of Epidemiology, Biostatistics and Occupational Health of McGill University. He is the Principal Investigator on two grants from the Canadian Institutes for Health Research (CIHR) that focus on the development, validation, and applications of new statistical methods for pharmacoepidemiology. He develops statistical models, which help in analyzing the safety and effectiveness of medications. Dr. Aviña-Zubieta is an assistant professor in the Division of Rheumatology at the University of British Columbia (UBC). He was also named the first ever BC Lupus Society Scholar. His research focuses on the economic burden and cardiovascular complications associated with systemic autoimmune rheumatic diseases (SARDs), which include systemic lupus erythematosus, systemic sclerosis, Sjögren's syndrome, polymyositis, dermatomyositis, and the systemic vasculitides. Dr. Barnabe did her training in rheumatology in Calgary and has a Masters degree in clinical epidemiology. She was the winner of this year's Young Investigator's award from the Canadian Rheumatology Association. Her major accomplishments include establishing a successful program in epidemiology and health services research on the topic of arthritis in Indigenous populations and initiating the adoption of new imaging technology for monitoring bone damage in rheumatoid arthritis. Dr. De Vera is a pharmacoepidemiologist/health services researcher and an assistant professor at UBC's Faculty of Pharmaceutical Sciences. Her research interests are in understanding medication adherence at the population level, developing and testing targeted interventions to improve adherence, and examining the use and impacts of arthritis medications among pregnant women with arthritis. Dr. Dutz is Professor of Medicine and Dermatology within the Department of Dermatology and Skin Science at the University of British Columbia. He is also a rheumatologist. Dr. Dutz is a senior scientist with the Child and Family Research Institute where he focuses his research on the skin immune system and the manipulation of this system to both promote immune responses and induce tolerance. Dr. Lacaille, Mary Pack Rheumatology Chair, is a professor in the Division of Rheumatology at the University of British Columbia, and a senior research scientist at the Arthritis Research Centre of Canada. She is a rheumatologist at the Mary Pack Arthritis Centre. She enjoys research that involves studying the impact of arthritis on employment and preventing work disability, and evaluating the quality of healthcare services received by people living with RA (using a population-based cohort of RA for the province of British Columbia). Dr. Kaplan is an associate professor in the Faculty of Medicine at the University of Calgary and has a Masters of Public Health from the Harvard School of Public Health. He is a gastroenterologist and epidemiologist with a clinical research interest in inflammatory bowel diseases (IBD). Dr. Kaplan also completed an IBD Fellowship at the Massachusetts General Hospital. Dr. Marra has a Bachelor of Science in Pharmacy, a Doctorate of Pharmacy, a PhD. in Epidemiology, and is a Fellow of the Canadian Society of Hospital Pharmacists (FCSHP). His health research focuses on health economics, quality of life research, and pharmacoepidemiology. Dr. Marra is also the mastermind behind the screening tool for arthritis within the ArthritisID and ArthritisID PRO mobile applications. Dr. Li is Associate Professor, Harold Robinson/Arthritis Society Chair in Arthritic Diseases, and Canada Research Chair in Patient-Oriented Knowledge Translation at the Department of Physical Therapy at the University of British Columbia. Her research focuses on two areas: models of care in the management of arthritis, and the development and evaluation of knowledge translation strategies. She is an expert in clinical epidemiology, knowledge translation, clinical trials, and survey design. Over the past 12 months, ACE received unrestricted grants-in-aid from: AbbVie Corporation, Amgen Canada, Arthritis Research Centre of Canada, BIOTECanada, Bristol-Myers Squibb Canada, Canadian Institutes of Health Research, the Canadian Rheumatology Research Consortium, Celgene Inc., GlaxoSmithKline, Hoffman-La Roche Canada Ltd., Janssen Inc., Pfizer Canada, Purdue Pharma L.P., and the University of British Columbia. ACE also receives unsolicited donations from its community members (people with arthritis) across Canada.